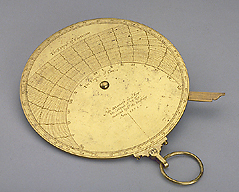 The instrument is similar in shape to an astrolabe with a planisphere on the mater and an azimuth dial on the back. A simple throne with a suspension ring is fixed to the rim of the mater. The rim of the mater bears a double degree scale 0 to 90 to 0 to 90 to 0 and 0 to 360, numbered by 10 and divided to 5 and 1. The mater itself is engraved with a Gemma Frisius universal projection. The ecliptic is marked with the symbols of the zodiacal signs. There is a semi-circular plate with the same universal projection. The ruler and fixing mechanism are replacements. The reverse of the instrument is laid out as an azimuth dial. The tropics are labelled 'The Tropick of Capricorn' and 'The Tropick of Cancer'. The equator is indicated by a double line engraved with alternate shading. The solar declinations are indicated by lines marked with arrowheads every 5 degrees, divided to 1. The hour lines are numbered IIII to XII to VIII, divided to 20 minutes. Along the rim is a degree scale 0 to 90 to 0 to 90 to 0. In the circle created by the markings for the tropic of Cancer is the inscription 'An Azumoth dyall for the latitude 52 deg. invented by Sr Ro Duddeley Ano 1598'. The instrument was purchased in 1894 and is described in F. A. B. Ward, A Catalogue of European Scientific Instruments in the Department of Medieval and Later Antiquities of the British Museum (London, 1981), p. 120, no. 346.